Two separate 50W solar-powered systems (the wood blocks on the wall) supply the power for cordless tools, paint booth lighting, and some domestic uses. 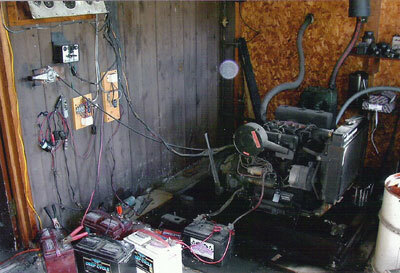 The 3-cylinder diesel engine runs an air compressor, supplying a very high capacity air tank. Many tools are air-powered, as is the domestic well water pump. The small solar panels have saved thousands of dollars in diesel fuel. They've paid for themselves many times over in a few short years. It's actually much more organized than it appears. 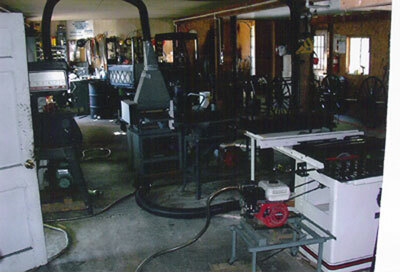 Some tools are gasoline-engine powered, such as the table saw in the foreground, and the planer near the center of the photo. The drill press, band saw and other large tools are air-powered. Some of the PVC air piping system is visible top center. The gasoline engine exhaust runs outside through flexible piping, visible on the floor, bottom left. A carriage and surrey (without a fringe...on top) are visible if you know what you're looking for. They are not on the running gear.